This time of year many people make resolutions to start new diets or lose weight. But for some, efforts to lose weight may represent a bigger health concern. Eating disorders occur in people of all ages, genders and body types and are characterized by having an emotional relationship with food. 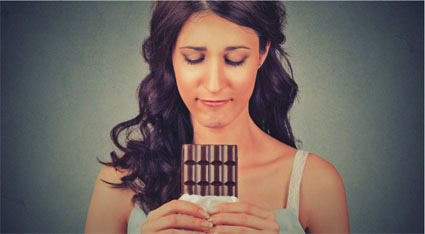 Signs that someone has an unhealthy relationship with food may include using food to manage difficult emotions, find control or comfort, or feeling guilty about eating. It can involve restrictive eating, overeating, or feeling as if you have to earn, or deserve, food. A healthy relationship with food means listening to your body, eating when you’re hungry, and stopping when you’re full. It involves not viewing food as good or bad, but as fuel for a healthy and fulfilling life. A healthy relationship with food is one that is flexible and has balance, variety and moderation. It means eating all food groups, unless you have an allergy, and being willing to try new foods. It means sometimes eating out and sometimes preparing meals at home. It involves having a healthy relationship with your body and not making negative comments about what you’re eating or about your size or weight. and a physician can help you make changes that are important for your health and happiness. Regardless of what relationship you have with food, make this the year to choose health and be mindful of your relationship with food and your body.